If your hamster has developed an unusual squint or has a red, crusty, pus-filled or otherwise irritated eye, she may have developed a case of hamster "pink-eye," or conjunctivitis--an infection of the eye or lid tissue. Call your veterinarian for an appointment, and don't panic. Pink eye may be unsightly and uncomfortable, but with a few days of proper treatment and loving care your hamster's eyes will likely be bright again. Hamster pink eye can be caused by several things, including viruses, bacterium, fungi or external irritants. In rare cases, conjunctivitis can stem from a severe tooth infection or an abscessed wound. Viral infections may be contagious to other animals and even humans, so it is important to get your pet's condition properly diagnosed by a veterinarian, and always wash your hands after handling a hamster. Your veterinarian will choose the best form of treatment for your hamster's pink eye. After flushing the affected eye with a saline solution, the vet may apply an antibacterial ointment. Further oral or applied antibiotics may be prescribed, and you will most likely need to clean the eye once or twice a day with a sterile cotton ball and warm water. Keep your hamster's cage clean of excessive debris and dust, which may irritate the lining of his eye and contribute to conjunctivitis. Remove waste frequently to avoid the possibility of bacteria and fungi build-up inside the cage--both potential causes of pink eye. Introduce companion animals only after a quarantine period to ensure that they are not harboring an illness like conjunctivitis that could make your hamster sick. Treat your hamster's pink eye twice a day for 5-14 days, depending on its diagnosed cause and your vet's recommendation. Bacterial conjunctivitis usually resolves faster than viral conjunctivitis, which usually takes two weeks and can require even lengthier treatment for stubborn infections. 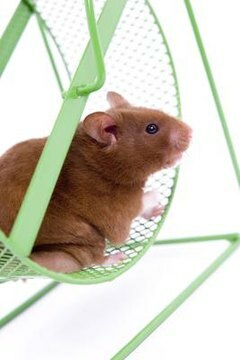 If the problem has not resolved within three weeks, the cause may be "reactive," meaning linked to something (cigarette smoke, fumes, ammonia, aerosols or other cleaning products) occurring in your hamster's environment. Eliminate all possible irritants until the eye heals, then re-introduce necessary products one at a time, waiting a week between new introductions, until the source of irritation is discovered. Alternately, eliminate all possible sources of irritation entirely from the area of your hamster's cage, and keep his home--and his eyes--irritant-free. If your hamster has developed an unusual squint or has a red, crusty, pus-filled or otherwise irritated eye, she may have developed a case of hamster "pink-eye," or conjunctivitis--an infection of the eye or lid tissue. Your veterinarian will choose the best form of treatment for your hamster's pink eye. After flushing the affected eye with a saline solution, the vet may apply an antibacterial ointment. Treat your hamster's pink eye twice a day for 5-14 days, depending on its diagnosed cause and your vet's recommendation.